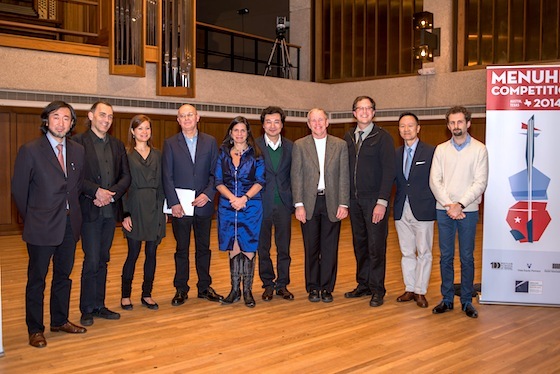 AUSTIN, Texas — After yesterday's marathon Senior Semi-Finals at the Menuhin Competition, members of the jury today took their turn in the spotlight, giving master classes and performing a noon concert. 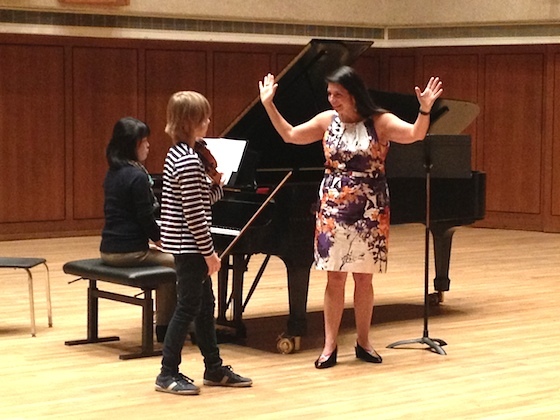 The morning began with a master class by Jury Chair and violin professor at Curtis Institute, Pamela Frank, who is certainly a master at giving master classes! 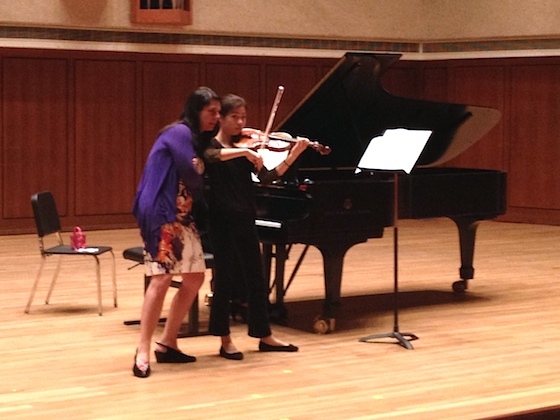 Claire Wells, 12, of Plano, Texas performed the first movement of Brahms Sonata No. 1 in G major. Pamela said that her playing was beautiful -- but maybe a little too much so. "Beauty only means something when you have contrast," Pamela said. Pamela encouraged her to pay more attention to how dynamics related to one another, asking her to locate the softest place in the entire movement. "I would encourage you to see dynamics as character markings instead of decibel levels," she said. She also advised her to look at other markings in the movement; for example, in a spot marked to be played tenderly, Claire's playing was on the intense side. "Please look up the words, because they mean something. The sound you choose should reflect the character and dynamics at all times." Finding one of the quieter spots in the movement, Pamela coached her to keep the soft volume going for truly as long as it was marked. As Claire played the spot, Pamela hovered, holding her back, "Not yet, not yet, not yet," then when the dynamic changed, "NOW! Go to forte!" It reminded me of the soccer moms on Saturday mornings, "Kick the ball, NOW!" "I'm screaming like a maniac but it's not my fault," she said, "I didn't write it!" When they finished this passage that required so much restraint for the "piano" marking and then so much energy when it grew louder, Pam asked, "Was it comfortable?" Claire admitted, "It feels less comfortable." This made Pamela grin, "and what does that do to the music?" she asked. It makes the music uncomfortable also -- in other words, it gives it tension. And we want musical tension! "I don't think we should play for comfort," Pamela said. "If I feel comfortable, there's probably something wrong." Brahms is full of delayed gratification, and that's something that the performer must illustrate. Pamela had her play a "sustenuto" passage, this time something that was unrelentingly loud and intense. "Keep up the intensity the whole time, until you are dripping with sweat!" she said, and Claire did so. The effect was a success. "Playing is not all in the head; if you are sweating, it's probably good," Pamela said, adding, "That's the bare minimum intensity I would want from you for that spot." She wanted Claire to re-try a passage marked "con anime," which, she pointed out, does not mean "with animation." It means "with soul." "You have soul for three notes, then the next three no soul, then soul, no soul…I want soul the whole time!" Soul, by the way, seems to be vibrato! "Look at (the movement) as a total picture and try to be as specific as possible with your relative sounds, and dance!" Next, Korean violinist Donghyun Kim, 14, played "Introduction and Rondo Capriccioso" by Saint-Saëns -- a really strong performance of it. Pamela started by talking about the last page of the piece, which is thick with fast notes that fly by in a wash of spiccato. "The shorter the notes," she said, "the more music you have to make of them." In other words, she wanted more shaping and phrasing, taking cues from the harmonies in the piano. "Can you pretend these are slow notes, and make the most beautiful melody in the world?" She suggested smaller bows for smaller intervals, and larger bows for larger intervals. The violin and piano should have a democratic partnership and "the person with the most interesting part at the time should lead." On the last page, the piano has the interesting part. She warned against the common "gunshot and go" approach to this particular passage. POW, off to the races! "We should somehow be singing on our instruments at all times," she said. Then she turned to a slower part, the languid "Introduction," suggesting less rubato. "The hardest thing to do is to play expressively, in time," she said. "When you want to take time, change sound and color instead." Also, one should bring out the dissonances, the surprise harmonies, which requires listening well to the piano. "Every time there is a surprise chord, you should change color and sound." Conversely, when harmonies are consonant and expected, "keep it simple. We know what key we're in; you don't need to love that E for an hour." Something Pamela said often to the students was, "I love you, but…(insert complaint)"
By the end of his allotted time, Donghyun was catching the drift: "What is the dynamic marking here?" Pamela asked, after he'd played something rather forceful. He responded, "Maybe not forte?" In this place she pointed out the piano part, which sounds innocent and childlike. As he tried it again, a bit stressed from the effort, she stepped up to him from the side and smiled, "Cheer up!" and he laughed. Also playing "Introduction and Rondo Capriccioso" was Polish violinist Antoni Ingielewicz, 12. In his case, Pamela focused on making sure sequences in the music aren't "clones" of one another, and on bow distribution. "If my hearing aid were off, I'd like to know how you do your phrasing, by how you use your bow," Pamela said. She advised against using full bows and going to the frog for no musical reason. "If you do that, you get a little bit of the ironing-of-the-shirts effect," she said, miming the ironing motion. "Just because it's a long note doesn't make it an important note." She also talked about the famous triple-stop passage, toward the end of the piece. "Just because it's chords doesn't mean you need to be angry with them," she said. The chords phrasing and internal dynamics, not just "chord-fest." During the last-page spiccato joyride, "there's a beautiful chromatic medley underneath that in the piano that we don't listen to enough," Pamela said. 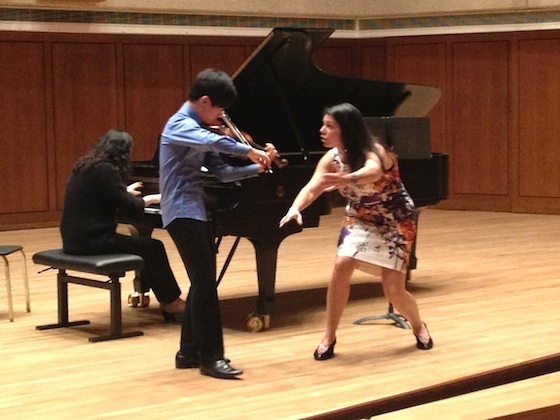 Last, Natsumi Tsuboi played Waxman's "Carmen Fantasy," which Pamela had to stop mid-way through, for the sake of time. 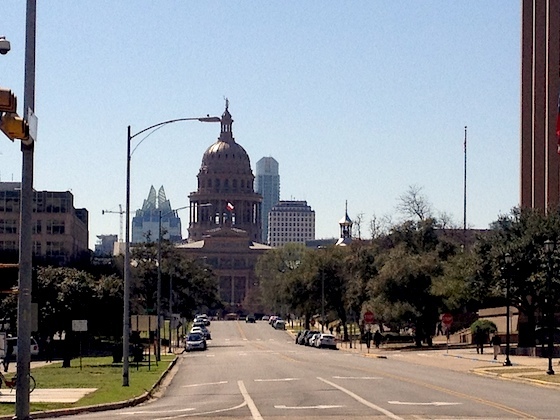 "I feel like you're telling me all of your secrets, from the very beginning," Pamela said. Had there been any truly "big moments" yet in the piece? There had not. In a piece like this, with no movements to break it up, pacing and restraint becomes very important. If every moment is exploding with emotion all the time, then it's a little like the boy who cried "Wolf!" "Nobody will comes rescue you when the wolf actually comes!" she said. Fast music needs to be musical. Slow music runs the danger of being pulled apart, so "don't milk the cow on every note," she said. "Sometimes simple is more expressive." The place was literally packed to the ceiling for the concert, with more than 500 people filling every available chair, lining the long staircase and balcony, and sitting on the floor along every wall. Brian Lewis and David Kim played the Bach Double, then flutist Marianne Gedigian joined the group for Vivaldi's Flute Concerto No. 3 "Il gardellino." For me, there was another big star in this show: Michael McLean's Violin Concerto, "Elements," from which Brian Lewis played two movements, "Earth" and "Fire," accompanied by an orchestra consisting mostly of Brian's own students. In contrast to the Baroque pieces at the start of the concert, "Elements" is soulful, moody and modern. "Earth" brings to mind Barber, and "Fire" is spooky and fast, a dark and rollicking dance. 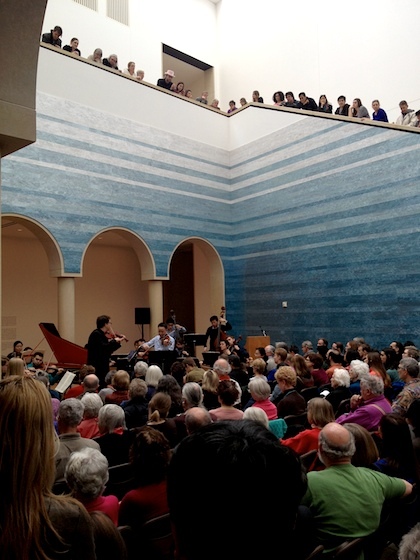 The overflowing crowd of all ages gave the performance a long standing ovation. Joji Hattori spoke about a Russian-based philosophy of the bow, in which the bow is held with a firm grip, then weight is applied. Even when the bow is "in the string," it is not resting there; the bow hand has a firm grip on it. He also suggested that pressing the bow to the string is not the best way to get big tone -- it may sound loud to you and perhaps the first row of your audience, but the sound actually carries better and farther when one does not press the bow. I dropped in briefly on Arabella Steinbacher's master class, but -- blame it on acoustics -- I truly could not hear what she was saying! Jury member David Kim, who teaches with wonderful humor, spoke at his master class about planning almost a choreography to follow for performances; just a basic plan of where you'll stand and how. This, he said, can be a comfort when when is performing while nervous. One audience member asked him how he teaches vibrato, and he suggested practicing it guitar-style, without the bow -- you can even do that while watching T.V. Also, you can put the scroll against the wall and practice the hand and wrist motion from the bout, making it very wide, then getting smaller and smaller. David said that in the numerous vibrato tutorials on Youtube, none suggests the one thing that really seems to help a student learn vibrato: "You have to be determined," he said. "You have to be obsessed and determined to fix your vibrato." For Ari Boutris, Kim suggested a more solid stance. "Did you start with Suzuki?" Kim asked. "Yes," Ari said. "Do you remember your foot chart?" At this point a tiny voice in the audience said, "Yes!" Everyone laughed. Kim: "Let's get that sucker out!" Though they did not literally use a foot chart, they worked on keeping centered and flat on the feet, not rocking back and forth like a boat. David also asked for "a high-cholesterol sound," big and fat. "We're going to have espresso, not watery McDonald's coffee!" At the end of this master class, we watched two top-notch performances, from which it would be hard to find any fault, and David admitted as much. 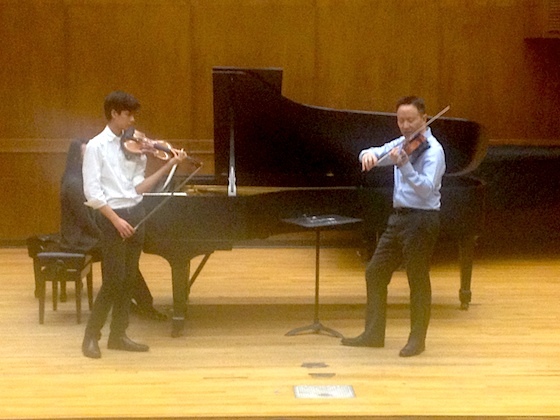 First, we heard Aaron Timothy Chooi play the first movement of Saint Saëns Concerto No. 3. 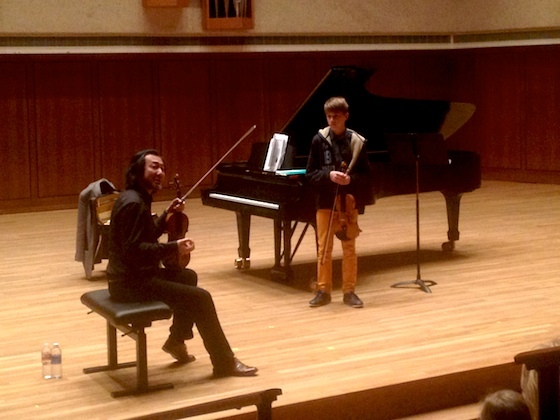 Then we heard Victor Li play Prokofiev's Concerto No. 2, first movement, with character and life. Fabuous review Laurie. Thank you! the more I hear about Pamela Frank the more I think she absolutely rocks. Thank you for all these details, Laurie! I have heard Pamela Frank play many times, at the Marlboro Music Festival in Vermont. She is a superb musician/violinist. I also have a recording of the Schubert String .Quintet in C. So, totally sublime. I am notsuprised that she is teaching at a great institution like the Curtis. 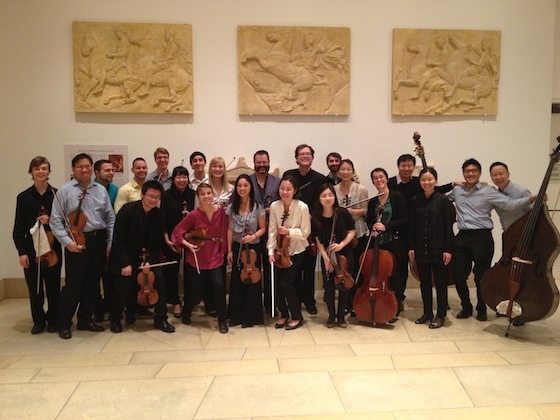 She is a excellent choice as a judge of violin at the Menuhin competition, and an inspiration for young musicians. BRAVA, Pamela. Great report again, Laurie! I can just see and hear how Pamela dances on the stage giving students pearls wisdom and gems of knowledge. An amazing experience to watch and it’s worth a trip just to see her master classes. I so wish I was there! This was the second time I saw Pamela do a master class; it's always such a pleasure to see the way she combines her highly-cultivated abilities -- both in musical analysis and in communication!